Almost 400,000 square miles of mountains, forests, natural grasslands and lakes define British Columbia, which stretches from islands off the Pacific coast to the Rocky Mountains. British Columbias economy is based on its abundant natural resources. Forestry ranks first economically, closely followed by tourism and mining. It was mining that spurred the British government to establish the colony of British Columbia in 1858, after a gold rush of 1857 in Fraser Valley. In 1895, after British Columbia became a Canadian province, a local mineralogist and his staff of five created the Bureau of Mines to promote exploration of the provinces mineral, coal, petroleum and natural gas resources. Over the past century, the Bureau grew into the British Columbia Geological Survey Branch (BC Survey) of the Ministry of Energy and Mines. Now, with dramatic budget cuts under the provinces newly elected conservative leadership, the BC Survey is in trouble. The BC Survey is over 100 years old. It has been around a long time, and has provided a core function for the mining industry in British Columbia, and it has also provided several functions to support government initiatives, says Steve Morison, president of the Geological Association of Canada. The BC Survey has focused on regional surveys, geochemical surveys and mineral deposit studies, but also has created hazards maps and assisted local sustainable development projects. If those services are reduced or eliminated, I dont know where it puts British Columbia in the context of a competitive environment for attracting exploration dollars and mining investment, Morison says. 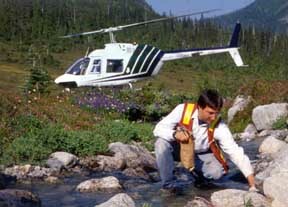 Eddie Newman collects a stream sediment sample for the British Columbia Geological Survey utilizing helicopter support for this remote site located north of Bella Coola in British Columbia's Coast Mountains. To date, the Survey has collected stream sediment samples from over 45,000 sites covering close to 70% of British Columbia -- helping the province to pinpoint mineral exploration targets, manage land and resources, and conduct environmental assessments. Photo by Wayne Jackaman, courtesy of BC Geological Survey. The British Columbia government, elected in 2001, has been reviewing its core services to decide where to cut spending. They plan to reduce spending by $1.9 billion over the next three years, including a 38 percent budget cut to the Ministry of Energy and Mines. The Ministrys divisions include electricity development, aboriginal relations, geothermal resources, oil and gas, and mining  where the BC Survey comes in. Cuts began on Jan. 17, for the 2002 through 2003 fiscal year. The Ministry will continue spending more funds on oil and gas development, so the cuts will hit the BC Survey hardest, perhaps by as much as 70 percent, says Atholl Sutherland Brown, who was a geologist for BC Survey for 33 years and who wrote a book about its history. He says the budget cuts are unlike anything the BC Survey has ever seen. After the first-year cuts in January, the review deemed eight of the 45 geologist positions at the BC Survey redundant. With the planned cuts ahead, Brown says, more and more people, good people, are leaving in anticipation. By the end of the three-year cuts, there will not be enough geologists left in the BC Survey to be able to continue geoscience work, Brown says. The Honorable Richard Neufeld, Minister of Mines, disagrees. He says the Ministry and Survey will still be able to provide geoscience services, but just in a different fashion by targeting areas in the province for which industry wants more information and by involving the private sector. Its just that what we have historically done  and what I think most provinces have historically done  is continued to map the whole province even though there was no activity. So were just going to target areas where there is good activity as far as miners and prospectors, and go from there, Neufeld says. Historically, however, the BC Surveys scope has been broader. Although the Geological Survey of Canada is responsible for national seismic monitoring, a few years ago local government groups asked the BC Survey to create earthquake maps of Victoria, which are now available online. Also, we ran initially in conjunction with the federal government, but later on our own, a broad surface geochemistry program, which was very successful. We did more than just hunting for mineral deposits, Brown says. The strength of the BC Geological Survey was their really remarkably perceptive fieldwork. Theres no money for the Survey to do any fieldwork, Brown says. British Columbia Premier Gordon Campbell and Minister Neufeld have received hundreds of letters from members of the U.S. and Canadian geological communities, resonating concerns about the long-term future of geoscience in a British Columbia absent a strong geological survey. Generally, the private sector does not fill the gap that a provincial government or federal government has in respect to baseline geoscientific surveys, geochemistry, geophysics, basic regional framework mapping and minerals deposit research, Morison says. With a dozen more geologists expected to leave the BC Survey by the spring, it is a desperately poor situation for geoscience, Brown says.